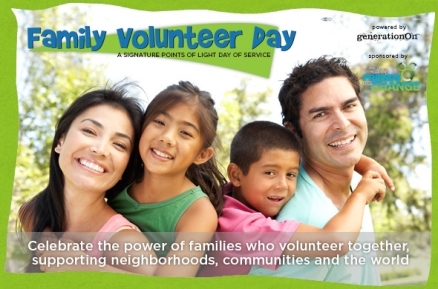 Set a great example: Family Volunteer Day is Saturday, November 22! | Back to Basics Learning Dynamics, Inc.
Family Volunteer Day is a day of service that demonstrates and celebrates the power of families who volunteer together, supporting their neighborhoods, communities and the world. Family Volunteer Day is held on the Saturday before Thanksgiving to kick-off the holiday season with giving and service. To get your family ready, read a three-part “Families and Volunteering” blog series filled with tips and tricks for families who want to get involved together in their communities. Parents from across the country offered advice and stories about how they help their kids make a difference in the world. Also check out “Tips for Parents of Young Children” for ideas how to get kids involved early in life. www.YSA.org/tags/families.